Warning: if you're one of the haters who says, "Stop trying to make Mean Girls happen," this news is not for you. But for all other Plastics, sexually active band geeks, girls who eat their feelings, and greatest people you'll ever meet, prepare to freak out! An unofficial Mean Girls cookbook, coauthored by Aaron Samuels actor Jonathan Bennett, is on its way. 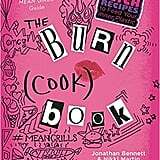 The Burn (Cook) Book comes out on Oct. 2 this year — just a day before Mean Girls Day, Oct. 3. The cookbook — which you can preorder now for $25 — contains a foreword by Gretchen Weiners herself, Lacey Chabert. What else can you expect within the sacred burn cookbook's pages? Oh, just gems such as "Gretchen's Wieners," "Fetch-uccine Alfredo," "You Go Glenn (Hot) Cocoa," "Ms. Norberry Pie," "Just Stab Caesar Salad," "Are Buttermilk Pancakes a Carb?," and "Face Smells Like a Foot Peppermint Bark." Consider us sold! Preorder the book ahead, then check out photos from inside the iconic hot pink cover.